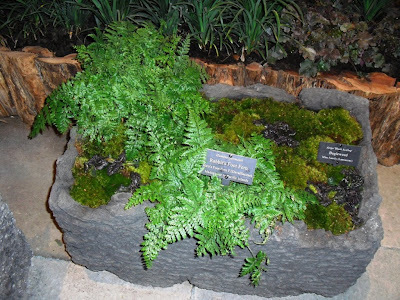 In Part 1, I mentioned that the emphasis on tropicals in many of the exhibits might have been perplexing to those who garden outdoors in Chicagoland's USDA zone 5. Well, this was not to say that temperate climate gardening was ignored entirely. One thing that was demonstrated very well was the seasonal use of containers in the garden. Rosmarinus officinalis (Rosemary), Ocimum basilicum (Basil), Petroselinum crispum (Parsley), and Thymus vulgaris (Thyme) in square containers. Every year, I say I'm going to make some decorative herb plantings, and never do. 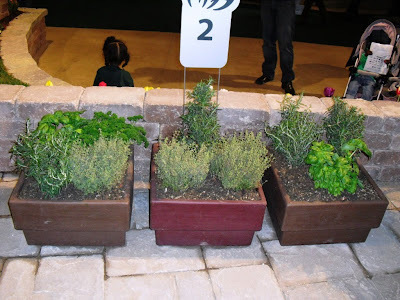 I'm not much of a cook, but I love the idea of an herb garden. Seeing them right in front of me at the show just might have been the inspiration I needed. 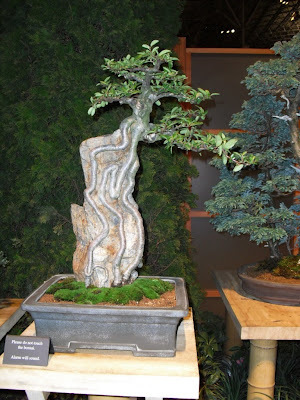 The Chicago Botanic Garden's Great Performances: The Art of Bonsai exhibit also included containers with ferns and other shade plants. Some of the ferns used in the containers were non-hardy types, but still gave an idea of what a lovely outdoor shade planting might look like with hardier ferns substituted. 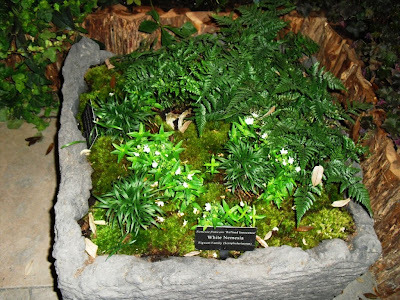 The troughs were made of hypertufa, something else I want to try. Luckily, Bob is on board with that idea. I need someone to hoist the Portland cement, which never seems to be available in less than gargantuan bags around here. Another couple of containers from the Broadway in Bloom--Four Seasons of Gardening boulevard I mentioned in Part 1. 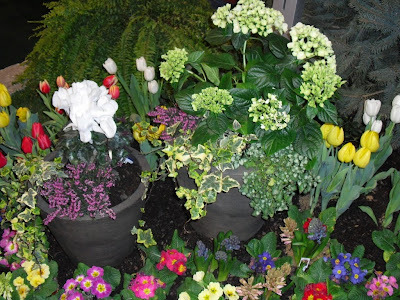 Ornamental cabbage (Brassica spp), Hedera canariensis, and Chrysanthemum in an urn make a decorative fall planting, while the copper pot with Solenostemon, Primula, and Buxus was pretty but puzzling--as far as I know, it's a little cool for Coleus when Primroses are at their best. Primula, Impatiens, Viola, along with Echeveria varieties and Kalanchoe orgyalis planted vertically, with Tulipa at the base. 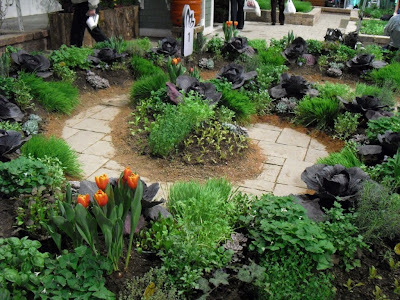 A spiral garden meant to evoke the French potager or kitchen garden. 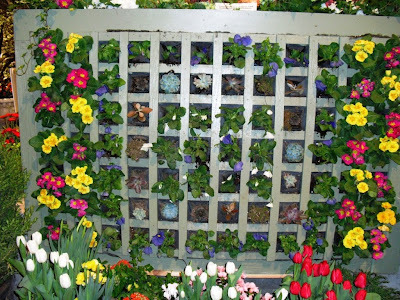 Last, but not least: I don't remember which exhibit the container below is from, but I wanted to include it because it looks so spring-y and fresh. Primula, hedera, Hydrangea, Tulipa and more. I regret that I didn't get pictures from what could have been the most inspirational exhibit in the show for those of us who love the outdoors here in Illinois: Jeckle and Hyde: Prairie Restoration. It works through the stages of identifying invasive plants in the natural landscape, eradicating them, and encouraging the regrowth of natives in their place. My stepson Dave is involved as a volunteer with our local Conservation District, and spends several Saturdays a year helping clean up natural areas. I'm very proud of his efforts, and I was so pleased with this exhibit, which emphasized the importance of this work. I LOVE the spiral garden!!!! 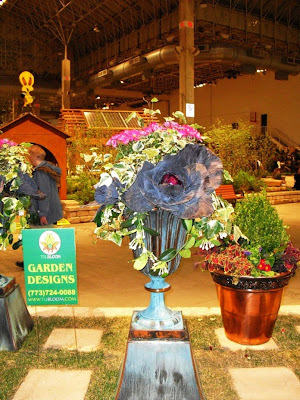 Getting excited about the SF garden show coming up next week.